The Best Buy Black Friday Ad has been released online. Don’t forget to sign up to receive all of the Black Friday Ads as they are leaked. Here are the best Early Bird Deals available at Best Buy. Best Buy will open at 12 am on Black Friday, some of the deals will be available online on Thanksgiving Day. See the full list of Best Buy Black Friday Deals here. Looking for more? 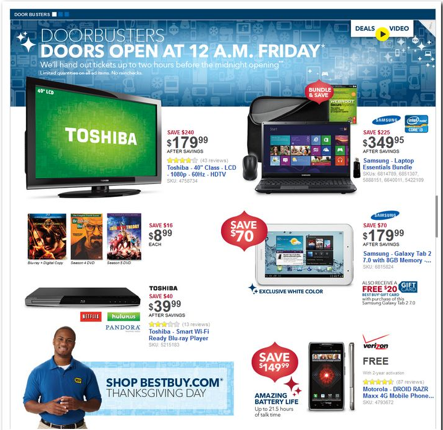 Read more posts about Black Friday Ads 2012 & Black Friday Deals 2012.